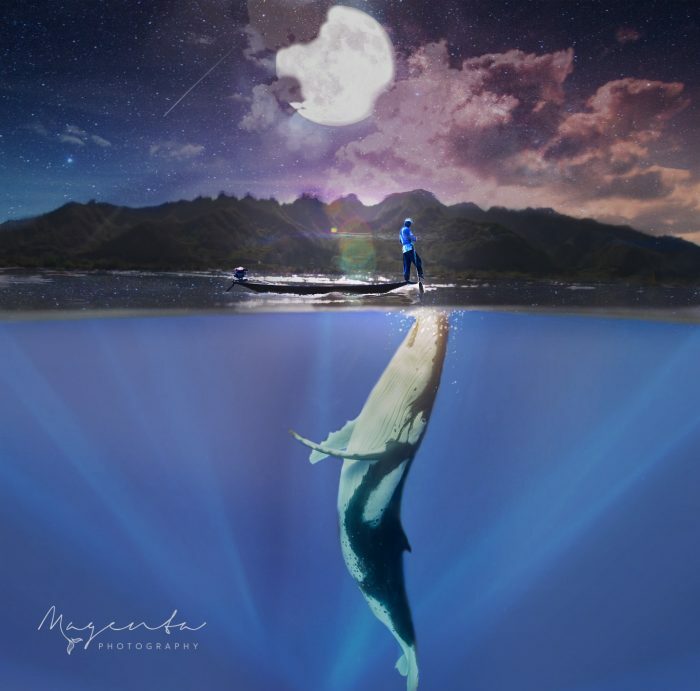 Magenta Hyde is a self-taught underwater photographer living in New Zealand and working in the islands of the South Pacific, predominantly Tahiti. Magenta’s passion for the ocean stems from an unexplained fascination she’s had with dolphins and whales since childhood. Magenta was born with a curiosity and awe for marine animals and feels a deep yearning to be in their environment. Today, she spends her winters in the South Pacific totally immersed in their world. Magenta’s focus is to create imagery of sea life that might propagate a little more of that awe and reverence in the people who see her work. 1) What is your artistic background? Can you tell us a little bit about your work? How would you describe your work and your style? How did you get into underwater photography? I have no formal background in the arts, I’m self-taught through and through. My initial agenda was to just get a job that somehow involved swimming with dolphins or whales, and photography ended up being the medium that leads me there. Through friends I heard about a position opening in Tonga for an underwater videographer, filming people swimming with whales. I had no camera, no money and no idea what I was doing, but I recognized it as an opportunity of a lifetime and possibly my only chance to be in the water with the whales. So armed with plenty of determination and a fire my soul, I borrowed money from a friend, bought myself a kit, bluffed my way through the job interview and got ready to move to Tonga. Six years later, I am still taking people out to swim with the whales and still pinching myself that this is now my reality. I focus more on still photography these days and the style of my photography is constantly evolving and changing. The ethos remains the same, but as I learn more technical skills I get more confident with pushing creative boundaries. My time underwater often feels surreal and otherworldly so sometimes I cannot believe what my eyes are seeing. This is the feeling I am trying to depict in my images. To me, the whales are the majesties of the ocean because they are formidable and welcoming at the same time. I am constantly motivated to communicate this sense through my art and at the same time I hope to elicit empathy from people with regards to their plight for survival. 2) Please compare and contrast the artist process of underwater photography versus photography on land? What challenges do you have to contend with? I am still learning so much about underwater photography and I am forever challenged. I don’t use dive gear so I am limited to my breath hold and also my buoyancy control underwater, which determines how stable I can be. There is limited light, lack of contrast, movement of the ocean and of course maneuvering yourself in the water with a 40-ton whale. There’s plenty to contend with under there and not a lot of forgiveness. You need to be locked and loaded before you jump off the boat and ready to get the shot in an instant. However, land photography presents its challenges too. Any nature photography where you need the elements to comply is going to be precarious, but the more risks involved the bigger the rewards, and the more stoked you are when you get ‘the shot’. 3) Can you tell us a little bit about A World Underwater? How did you come up with the concept and what was the inspiration for the piece? What is the key environmental message of ‘A World Underwater’? I was exploring themes around the fragility of the planet, specifically the oceans and all its inhabitants. In the media, there are so many calls for urgent action, and numerous warnings of a dire future if we don’t act now. This got me thinking about ultimately who will need to adapt in order to coexist? Is it humans or cetaceans? Is there even a future with us both in it? Its intended to provoke some thoughts about what the world will look like for our children. 4) Is there anything specific about ocean/water subjects that speak to you as an artist? 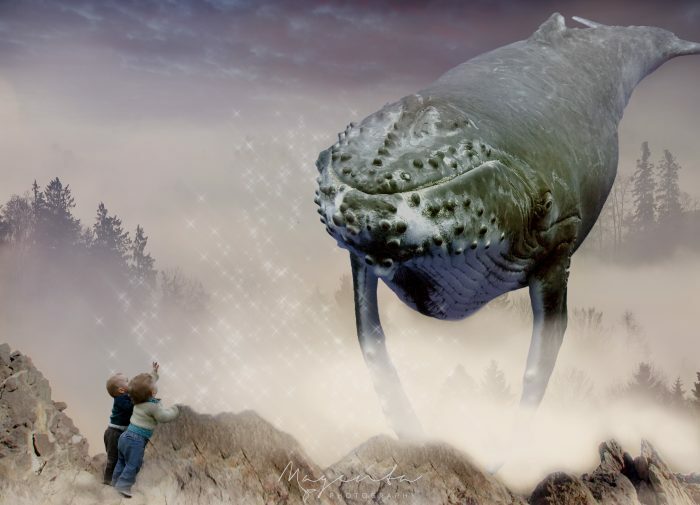 What are the challenges and opportunities of working with subjects as large as whales? 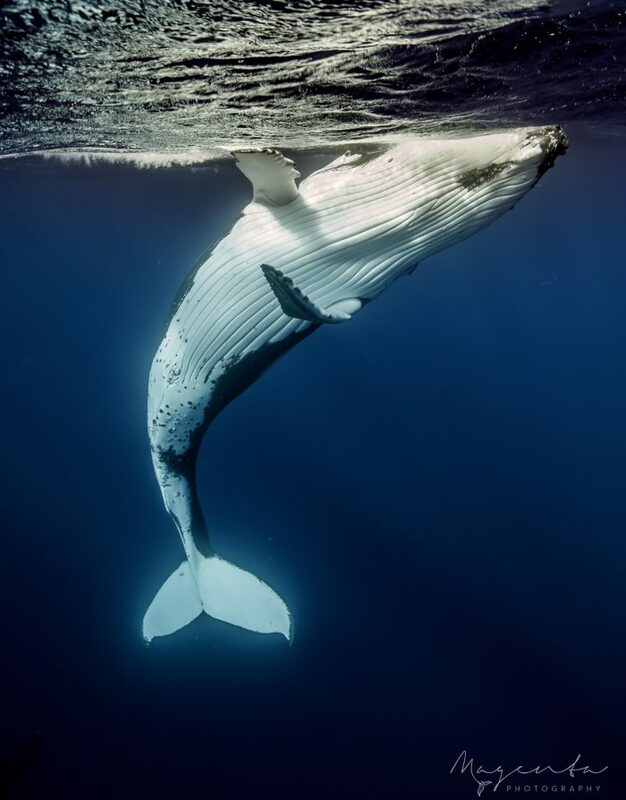 If Humpback Whales could speak (to humans) what do you think would be their primary request of humans? I have worked on boats with dolphins and whales for over 10 years now and what continues to inspire me and fascinate me is the mutual curiosity and affinity between cetaceans and us. 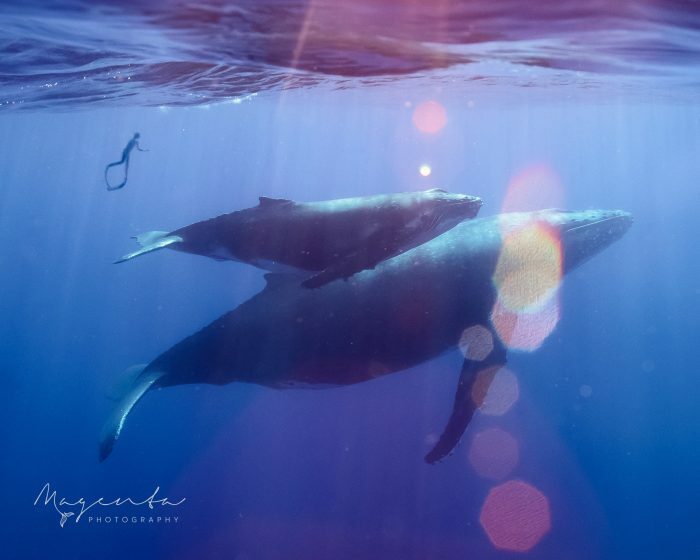 Countless times I’ve witnessed the whales initiating contact with humans: swimming towards us; checking us out and encouraging their babies to engage with us. It’s a unique behavior from a wild animal that, in theory, should be afraid of us. This is where I draw my inspiration as an artist. 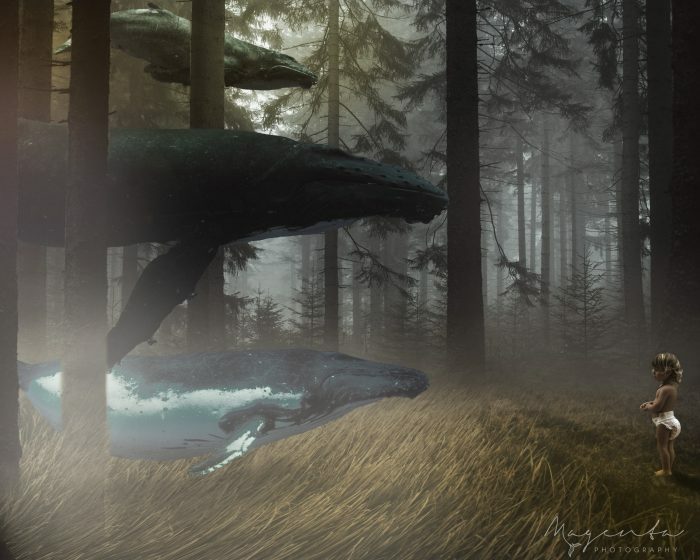 If whales had a request for us I’m sure it would be to remember that the planet is a living system of which we are fundamentally interconnected with. If we become more attuned to the subtle forces and primal rhythms of the ecosystems we inhabit and live more responsibly within them, that might be a good start towards healing our communities, our oceans, and ourselves.